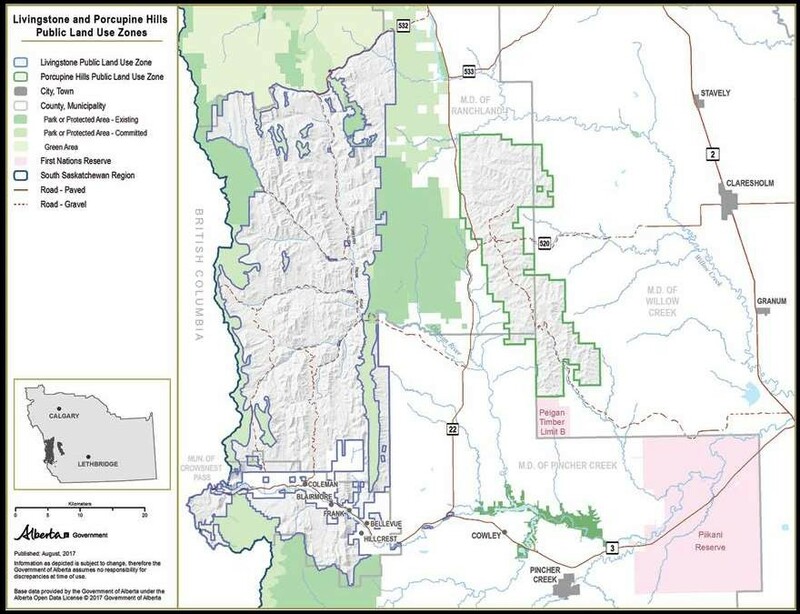 Porcupine Hills Coalition - Drafts of two new land-use plans, released March 27 by the Government of Alberta, are being welcomed by a wide variety of stakeholders, from ranchers to recreationalists to conservation organizations. The plans stem from the 2014 South Saskatchewan Regional Plan which committed to the development of a Land Footprint Management Plan (LFMP) and Recreation Management Plan (RMP) for the Porcupine Hills and Livingstone regions. The region is located an hour and a half south of Calgary, along Highway 22, also known as the Cowboy Trail, and is considered some of the most iconic landscapes in southern Alberta. The plans provide guidance for both industrial and recreational use of these important areas to ensure this landscape is protected and sustained into the future. 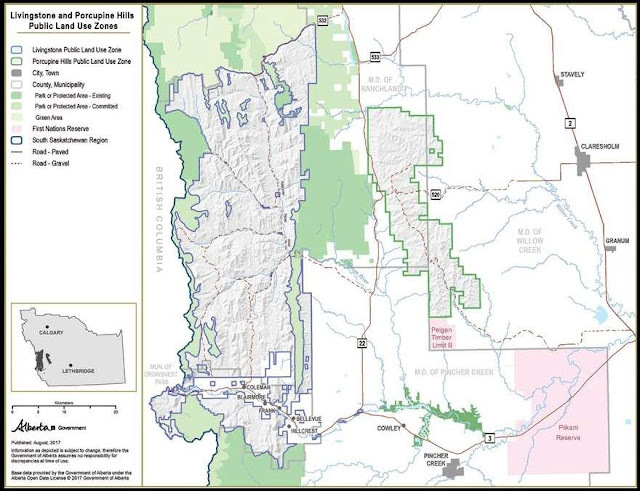 The Porcupine Hills Coalition, a grassroots, multi-stakeholder working group invested in the proper management of the area is encouraged by the release of the draft plans. Membership of this coalition is composed of approximately 70 individuals and organizations from many sectors and walks of life, and includes ranchers, landowners, municipalities, scientists, recreation groups, conservation organizations and others. These members have been working collaboratively for over three years to support the planning process and provide input into the plans. “We are particularly encouraged to see that the draft Land Footprint Management Plan and Recreation Management Plan include science-based limits on the number of roads and trails allowed in the area. This is an important step to achieve headwaters protection, biodiversity maintenance, restoration of natural areas and responsible use of public lands by all users,” said Katie Morrison, Conservation Director with the Southern Alberta Chapter of the Canadian Parks and Wilderness Society. “The science is unequivocally clear on this issue,” says biologist Lorne Fitch “Roads and trails, whether motorized recreation trails, public roads or industry access have seriously detrimental effects on water quality, wildlife populations and vegetation quality and diversity. We need to make sure these are in the least sensitive places and within appropriate overall limits. Carol Ostrom, a long-term Crowsnest Pass resident who has been recreating on public lands for 50 years, is relieved to see the provincial government stepping up their stewardship role. “The dramatic increase in unregulated OHV traffic and random camping has left heavy damage where there was previously clean water, wildlife and silence. It's been difficult these last few years to go for a hike or a horseback ride on public lands and not be confronted with the noise and environmental destruction of OHVs.” Ostrom is hopeful that with these plans all interest groups will work together to ensure that the needs of all groups are addressed in an equitable manner which puts nature first and foremost. The group points out that while the establishment of designated motorized trails in less sensitive areas is an important part of the plan, the Recreation Management Plan should manage for all types of recreation, including hiking, skiing, snowshoeing, hunting, fishing, backpacking, horseback riding, scenic driving and trail-riding and vehicle-based camping. Click here to view the plans. The forests of Southern Alberta provide water, sustain fish and wildlife and offer some of the province’s best opportunities for recreation and tourism. But pressures on our lands and resources are mounting. Good land-use planning ensures that our public lands are properly managed with and for Albertans. 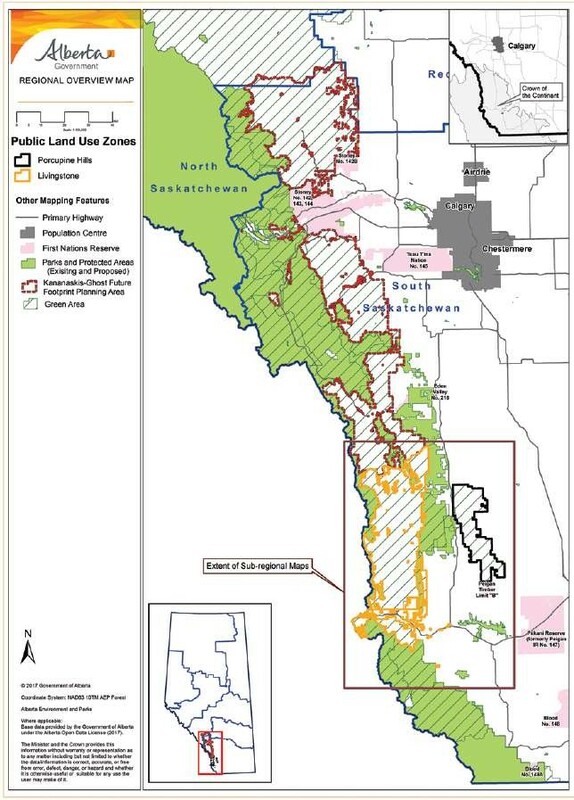 In 2014, the South Saskatchewan Regional Plan authorized the development of a Land Footprint Management Plan (LFMP) and Recreation Management Plan (RMP) for the Porcupine Hills and Livingstone regions. These recently released plans are an important step in preserving our outdoor heritage and protecting Alberta’s headwaters now and for future generations. What are the LFMP and RMP? What is a linear footprint? Linear footprints consist of the roads, railways, pipelines, seismic- exploration trails, transmission lines, and recreational trails.2 Decades of mismanagement have led to expanding linear footprints in Southwest Alberta, increasing damage to watersheds, wildlife, fish and ongoing user conflicts. Demands for better stewardship of our public lands from many stakeholders have intensified over the years in response to ongoing degradation. In the Eastern Slopes, recreational trails are by far the biggest linear disturbance.3 There are currently 4,053km of linear features in the Porcupine Hills/Livingstone with an average trail density of 2.28km/km2. This is almost 4 times the threshold to support many sensitive species.4 Better management is required to provide consistent and clear direction for managers and users. How do linear features affect the environment? Linear disturbances are also directly linked to increased probability of wildfire and associated losses, a growing concern across Alberta: “Increased access (e.g., road density) into forested areas often increases levels of successful, accidental (e.g., campfires and debris burning), or deliberate (i.e., arson) fire ignition.”10 Responsibly managing linear densities is positive for public safety, environmental effects and wildlife health and species richness. How does motorized recreation affect our land and water? Motorized recreation has the highest impact of any non-industrial activity on the landscape.1 The impacts of trails and Off-Highway Vehicle (OHV) use on Alberta’s lands and waters are serious and long-lasting. The science is clear that trails and motorized recreation are not compatible with protection of water, wildlife and fish. How does motorized recreation affect Albertans? While all recreational uses need to be managed responsibly, the damage caused by unregulated motorized recreational use is far greater than any other recreational activities: “OHV use across all seasons causes a disproportionate level of impact and damage compared to non-motorized recreational activities, such as hiking, biking, and horse riding.”6 The damage excessive OHV use causes affects the ability of other Albertans to sustainably and responsibly recreate. How is motorized recreation regulated on public lands? Currently in the Porcupine Hills and Livingstone regions there is no Public Land Use Zone or designated trail system. Existing motorized trails are ad-hoc trails created by default rather than design.11 Camping is similarly random and unmanaged and uncontrolled. In contrast, other activities on public land in Southern Alberta are subject to regulatory land use oversight. Ranchers require grazing permits and leases. Forestry companies require Forest Management Agreements. Industrial development requires impact assessments and operational permitting for each location. Hunters and anglers require licenses. Outfitters and hunting guides require permits. Approvals for all of these activities are issued with specific limits, seasons, and other conditions. These stakeholders are held accountable for their treatment of the Southern Eastern Slopes. OHV activities have consequences for all Albertans, but as a major impactful land-use, they have been uniquely exempted from regulatory requirements and accountability. It is reasonable to expect motorized trails and recreation to be an accountable land-use. Who initiates land use planning (and why)? Land use planning is a way to ensure that Alberta’s public lands are effectively managed with and for all Albertans. Alberta’s Land-Use Framework was introduced in 2008 to establish “a provincial vision of Albertans working together to respect and care for the land as a foundation for our environmental, economic and social well-being.” 1 As part of this process, in 2014 the Progressive Conservative government released the South Saskatchewan Regional Plan (SSRP). “Regional plans, developed with the input and feedback from Albertans, establish a long-term vision for the region, set the desired economic, environmental and social outcomes and objectives for the region using a cumulative effects management approach, and align provincial policy at the regional level to balance Alberta’s outcomes.” 2 Regional plans such as the SSRP, authorize the development of sub-regional plans such as the Land Footprint Management Plan(LFMP) and Recreation Management Plan (RMP). Who had input into these plans? Fact Sheet 4: What do Southern Albertans Value? What do Southern Albertans Value? How does land-use planning uphold these values? Land footprint and recreation management planning will ensure that all Albertans can sustainably participate in recreation for generations. “Regional plans … establish a long-term vision for the region, set the desired economic, environmental and social outcomes and objectives for the region using a cumulative effects management approach, and align provincial policy at the regional level to balance Alberta’s outcomes.” 7 These plans have been developed with Albertans, for Albertans and will ensure the future of sustainable land-use in our province. Heather Sinton and Rob Simieritsch. Porcupine Hills Recreation Management Plan Development, Alberta Environment and Parks. 2016. Dan Farr, Andrew Braid, Arnold Janz, Brett Sarchuk, Simon Slater, Agnieszka Sztaba, David Barrett, Gordon Stenhouse, Andrea Morehouse, Matthew Wheatley. Ecological Response to Human Activities in Southwestern Alberta: Scientific Assessment and Synthesis. Government of Alberta, Environmental Monitoring and Science Division. 2017. Ecological Response to Human Activities in Southwestern Alberta: Scientific Assessment and Synthesis. 2017. Ryan van der Marel. Update on Land Footprint Management Planning Livingstone-Porcupine Hills. Alberta Environment and Parks. 2016. Update on Land Footprint Management Planning. 2016. Update on Land Footprint Planning. 2016. Cardille, J.A., Ventura, S.J., Turner, M.G .Environmental and social factors influencing wildfires in the Upper Midwest, United States. Ecological applications. 2001. Prestemon, J.P., Pye, J.M., Butry, D.T., Holmes, T.P., Mercer, D.E. Understanding broadscale wildfire risks in a human-dominated landscape. Forest Science. 2002. Guyette, R.P., Spetich, M.A. Fire history of oak-pine forests in the Lower Boston Mountains, Arkansas, USA. Forest Ecology and Management. 2003. In Ecological Response to Human Activities in Southwestern Alberta: Scientific Assessment and Synthesis. 2017. Dan Farr, Andrew Braid, Arnold Janz, Brett Sarchuk, Simon Slater, Agnieszka Sztaba, David Barrett, Gordon Stenhouse, Andrea Morehouse, Matthew Wheatley. Ecological Response toHuman Activities in Southwestern Alberta: Scientific Assessment and Synthesis. Government of Alberta, Environmental Monitoring and Science Division. 2017. Ecological Response to Human Activities in Southwestern Alberta. 2017. Crisfield, V., MacDonald, S., Gould, A. Effects of recreational traffic on alpine plant communities in the northern Canadian Rockies. Arctic, Antarctic, and Alpine Research. 2012. van Vierssen Trip, N, Wiersma, Y.F. A comparison of all-terrain vehicle (ATV) trail impacts on boreal habitats across scales. Natural Areas Journal. 2015. In Ecological Response to Human Activities in Southwestern Alberta. 2017. Praxis Group. Albertans’ Values and Attitudes toward Recreation and Wilderness. Prepared for the Canadian Parks and Wilderness Society – Southern and Northern Alberta chapters. 2015. Webb, R and H.G. Wiltshire, Editors. Springer-Verlag Publishers. Environmental Effects of Off-Highway Vehicles. W.J. Knockelman, ‘Management Concepts.’ 1983. Kil, N., Holland, S.M. and Stein, T.V. Identifying differences between off-highway vehicle (OHV) and non-OHV user groups for recreation resource planning. Environmental Management. 2012. Ouren et al., Environmental Effects of Off-Highway Vehicles on Bureau of Land Management Lands: A Literature Synthesis, Annotated Bibliographies, Extensive Bibliographies, and Internet Resources. 2007. Ouren et al., Environmental Effects of Off-Highway Vehicles on Bureau of Land Management Lands: A Literature Synthesis, Annotated Bibliographies, Extensive Bibliographies, and Internet Resources. 2007. Encyclopedia Britannica, The Decibel Scale. 2018. Webb, Chris. OHV Noise Issues Are You Next? Motorcycle USA. 2005. Alberta Energy Regulator. Directive 038: Noise Control. 2007. Alberta Environment and Parks, Land-Use Planning Progress Report, 2014. Engagement Summary, Livingstone-Porcupine Hills Land Footprint Management Plan & Porcupine Hills Recreation Management Plan. Alberta Environment and Parks. 2016. Southern Advisory Regional Group. Planning it Right, Albertans Collaborate on Public Lands Stewardship. 2017. Government of Alberta. South Saskatchewan Regional Plan Workbook Results. Environment and Sustainable Resource Development. 2010. Southern Foothills Community Stewardship Initiative (SFCSI). Values and Voices: Stewardship Priorities for the Southern Alberta Foothills. Report of the Southern Foothills Community Stewardship Initiative. 2011. Southern Foothills Study (SFS). The Changing Landscape of the Southern Alberta Foothills: Report of the Southern Foothills Study Business as Usual Scenario and Public Survey. 2007. The Miistakis Institute. MD Ranchland – Community & Conservation Values Mapping Project – Phase III Report. Prepared for Municipal District of Ranchland No.66. 2011. Water Matters Society of Alberta. Source to Tap: Community Conversations on Headwaters Health and Stewardship in the Oldman River Basin: Summary of Community Dialogues. Prepared for the Oldman Watershed Council. 2013. Praxis Group. Community Values Assessment for the M.D. of Pincher Creek No. 9. For: The Southwest Alberta Sustainable Community Initiative and Municipal District of Pincher Creek. 2012. Alberta Environment and Parks. Land-Use Planning Progress Report. 2014.